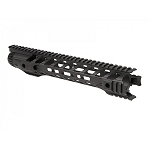 The Carbine 1 Piece Free Float Rail System guarantees precise fitment with your Mil Spec Standard AR M4 upper receiver. All aluminum T6 aircraft 6061 construction with level III hard anodize finish. Slim profile finish for superior grip and handling.